A Five-hectare vast Resort with One-hundred ten meters Beachfront of White sand, Three Lagoon-shaped Swimming pools, Children's Playground, Recreation and Water Sports Center, Amuma Spa Wing and a One-hectare Privare Island. 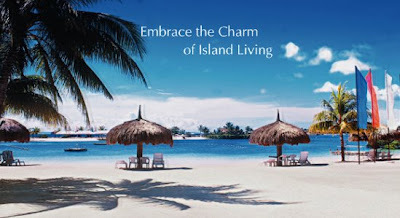 Is what Maribago Bluewater Beach Resort wants you to experience "Embrace the Charm of Island Living". Resorts Phone number is +6332 492-0100. You can always log on to their web address for more info at http://www.bluewater.com.ph/ and be updated with Maribago BlueWater Blog at www.bluewateronline.wordpress.com/. This is a Summer Blowout Post for all Bloggers initiated by Cebu Bloggers Society Events Committee. For more of it log on to the forum here or log on to Pinoy World Site. All Image Credits to http://www.bluewater.com.ph/. 4 comments: on "Maribago Bluewater Beach Resort Summer Blowout"
@PinoyApache: thanks a lot Sir Jing! See you at Maribago Bluewater this May! @Bryan: Ligo ta ani do!